The Congo African Grey Parrot (Psittacus erithacus erithacus), is the largest and more commonly known of the two types of the African Grey Parrot. Congo African Grey Parrots are approximately 12 – 14 inches (32-26 cm) in length and usually weigh 16 ounces (450 g). 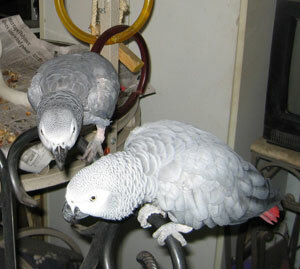 They are gray in color and have a solid black beak with a bright red tail. Congo African Grey Parrots originate in Central Africa, from the southeast portion of the Ivory Coast extending to western Kenya and down to Tanzania and Angola. The Congo African Grey Parrot from Congo can be somewhat larger and a lighter gray in color than one from Cameroon which would be medium-sized and a darker grey in color. It has been determined that if you start in the country of Ghana or Togo and radiate outward in all directions there is a progressive change in shade and size of the Congo African Grey Parrot. The Congo African Grey that is indigenous to Ghana and Togo is nearer the size and about as dark as the Timneh African Grey. As you branch out in all directions, Congo African Grey Parrots get larger in size. As you go eastward, the shade of grey lightens, and toward the South, the shade of grey remains the same. Congo African Grey Parrots are talented talkers and begin talking between 12 and 18 months old. They love to mimic sounds and are quite adept at sounding exactly like their owner's voices. Congo African Grey Parrots that are exposed to more human interaction will tend to speak more cognitively than those that aren't. African Grey Parrots are flock birds and need interaction and stimulation to develop into their full potential. They are sensitive and very aware to what is going on around them. Time out of their cage and play time with their humans and toys are extremely important.